The other day I illustrated why Metrics are awesome and how they serve coaching relationships. Today I’m going to sketch out the ways in which CoachAccountable Sessions are great. A nearly-blank slate! You can use a blank if you want to, though. 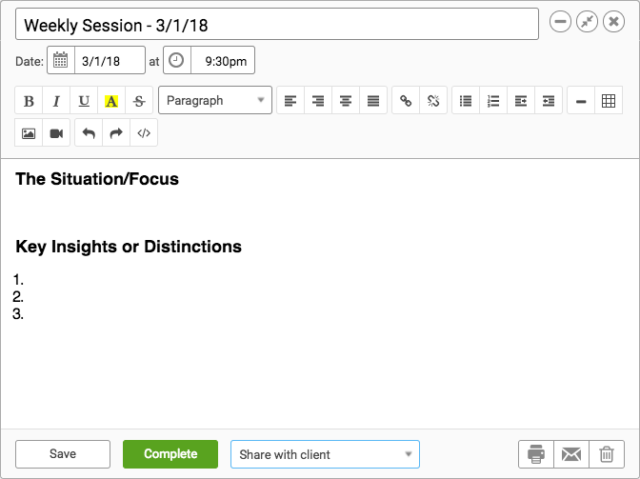 At the most basic level, sessions aren’t that special: a way to take notes in an editor with formatting options much like any word processor. Even with your collection of customizable templates that serve as starting points for your note taking (the above is exactly what I use for regular weekly sessions), we’re not yet talking anything that MS Word can’t do once you’ve hammered out a few template files. This tab tells me what she’s been up to…. And this is my color-coded guide for upcoming (and past) shenanigans. Brilliant. At a glance (and with the aid of spiffy color coding), I can quickly glean how exactly my client is doing. Metrics are color coded according to how the figure stacks up against the goal trend line: green and we’re good, light green we’re good but at this rate we’re slipping, yellow we’re under the mark but getting closer, red, well you can guess. Actions show red when late, yellow when nearly late, and green when on time. I see Bran wrote a new journal entry, and if there were any newly shared files or completed worksheets, well, those would show up here too. So that’s my pre-game: it’s quick, it gets me oriented with what exactly my client is dealing with, and informs me of where she’s succeeding, where she’s not. This will all save us precious minutes on our coaching call, which of course generally feels like it goes by too fast. Beautifully, this also softens the pain of a progress report in an off week: we can jump straight to dealing with what’s so. Excuses or hemming & hawing to save face are completely skipped over. When the call starts I click the “+Session Notes” button, choose my usual template for weekly calls and hit “Begin”. Then I put down CoachAccountable for most of the hour: I find typing to be a distraction from focused coaching, and have little problem recalling the big points (for inclusion in the session notes) until after the call. 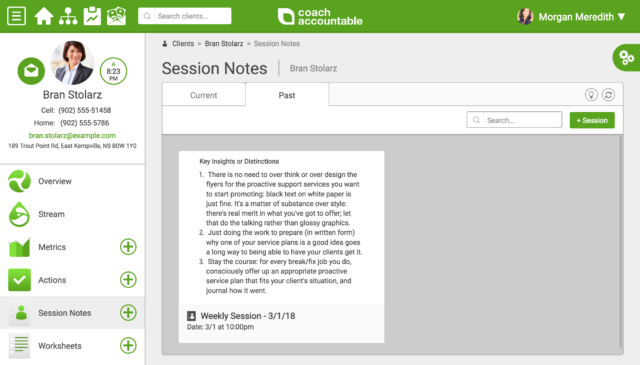 For reasons that will be clear below, my clients know to be logged in themselves to CoachAccountable when possible. It’s not my purpose here to riff on the actual substance of coaching, for that is a matter of an individual’s style and training and not to be dictated by software. But I will offer of a few things that I do do during my coaching calls as they pertain to CoachAccountable. “Great, put that in as an action.” is one of my new favorite things to utter during calls. Almost invariably my clients and I will hit upon several useful actions that they can focus on in the coming week, and I let them make their own action plan by entering a set of actions. 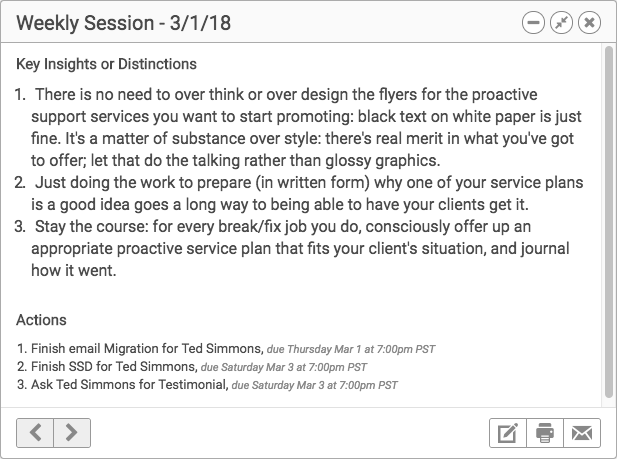 “Don’t forget to set a few reminders for that.” is another choice phrase, one which I reserve for the kinds of actions that a particular client may be apt to procrastinate on (this is another bit of useful awareness that the color-coded record of actions is good for!). Towards the end of the call I’m apt to hit the refresh button on the Actions tab and glimpse at what my client has set up for themselves, including due dates. Metric annotations are another thing I’ll often call for during our call. 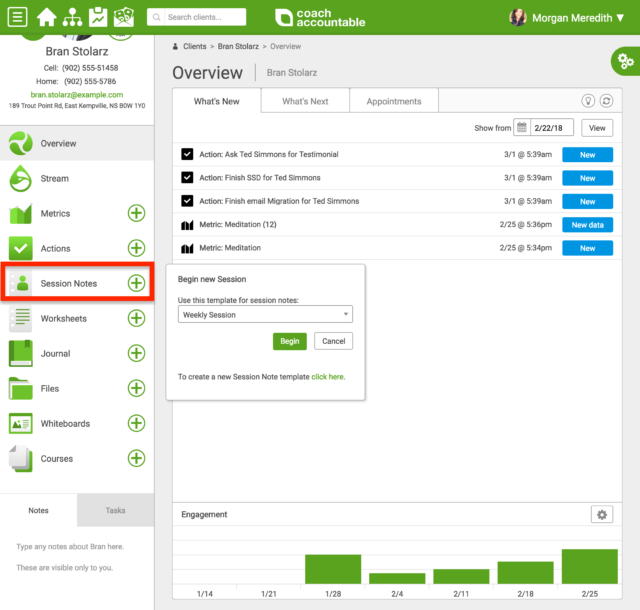 Generally, all the Metric stats are entered by the time I get on the phone with my clients. But we might discover a few nuggets of insight about those stats as we talk. So I might add (or ask my client to add) some annotations on some of the data points to really build the story around the raw numbers, things like why there was no movement for a week, or why there’s been a large burst in the last two weeks that hasn’t been there the last two months. Realizations like these are gold for eliminating pitfalls and doubling down on successes, so during our call we record them. Less often but occasionally I might assign a worksheet as homework, fitting to our discussion and/or plan moving forward. I might also tell my client to make an action of the form “Write a journal entry about…”. Having clients journal within CoachAccountable on relevant topics is useful to both of us: entries go in the tangible record of work done in the coaching relationship that both parties can see and look back upon at any time. Towards the end of our call I like to review that the actions (and possibly metrics) that have been created in CoachAccountable constitute a good game for my client in the week to come: not too much, not too little, and with realistic deadlines. Then the call ends. At this point my practice is to type up the session notes right then and there, while still fresh in my mind. My clients find getting these useful: a succinct account of what we just went over, delivered right to their inbox within minutes of our call. I think it serves nicely to remind them of the key points, and get them better focused on a good week. 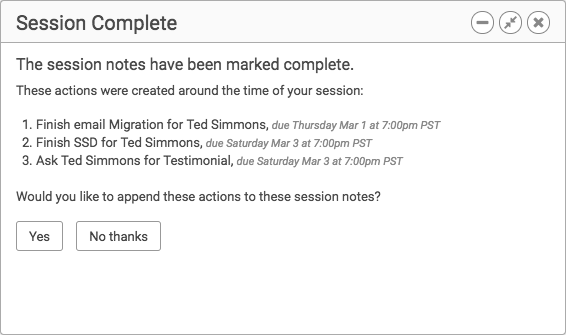 With a tick of the check box I can CC myself, and I can add a personal note about the session as a whole that will go direct to my client. 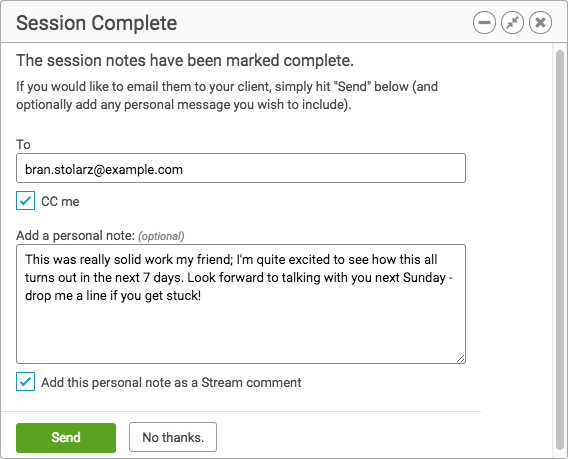 Adding the note as a Stream comment puts it into place as part of the dialog between client and coach in the running records of all things organized by CoachAccountable. Prepping for sessions is a snap. Knowing how things are going beforehand saves valuable session time. Automated reminders help ensure you start on time. 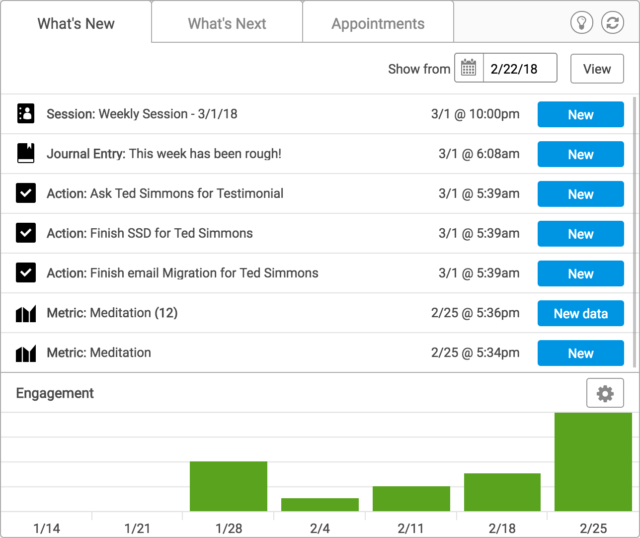 A clear plan of action can be created and shared in real time, and reminders can keep that plan on track between sessions. Notes can be readily emailed or printed, and are there for later reference. Look nice? It is. You can try it with your own clients on your very next coaching call with a free 30 day trial. I didn’t realise that the session report could include actions made around the same time – brilliant! Thanks! Yes, that feature is a prime example of me knowing to want something based on my own experience, and building it in accordingly.